What does it mean to have, to own, to be in possession of things? What is money and what role should it play in my life? What is my relationship to the earth, to my own body, to my experience of the world though my five senses? These are questions I am pondering this month, following a very powerful workshop at the Chalice Well, where our group of intrepid alchemical adventurers marked the entry of the Sun into the astrological sign of Taurus, this abundant phase of the year where nature offers us its first blossom. As the bright colours, sweet smells, sounds, tastes, and tactility of Spring awaken our senses, so we are offered an opportunity to fully inhabit our sensuous nature and appreciate the great fullness of life. 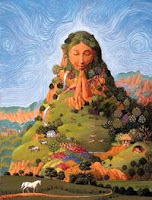 The beauty and sanctity of the Chalice Well and the ritual journey we took in the Taurus figure of the Glastonbury Zodiac, offered us the opportunity to experience this at a profound level. 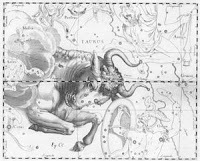 In contrast to Aries, Taurus quietly draws toward itself what it needs for its own sustenance and well-being, drawing on the magnetism of the earth element, and the attractive power of Venus, its ruling planet. So it is then, through connecting to this energy in our own lives, we can learn to attract and magnetize things to us, by being attentive to and appreciating what is right in front of us. As we learned during our Taurus weekend, by drawing on this resource and allowing our sensory experiences to come to us (rather than seeking them out), we gain access to a level of perceptual sensitivity which we might ordinarily miss. Ben Rayner, who was co-facilitating the weekend with Anthony and myself really helped us to realise this, through the sensory perception and expanded awareness practices that he taught us. The Taurus phase teaches us the value of “enough”, the recognition that we may already have everything we need to live a happy and fulfilled life. In the current economic climate, our culture is having to face the realisation that stuffing our lives full of “more” isn’t sufficient for our sustenance and well-being. I remember Lynne Twist once saying that in our modern quest for abundance, we often sail right past the exquisite beauty of “enough” without even realising it – driven on by our scarcity-ridden belief that “more is better”. So my own practice this month is to sense what is enough for me, to realise what I actually need to be secure and what I could happily and joyfully do without – and celebrate that! I equate this practice of what I call “authentic ownership” with the experience of fully inhabiting my body, claiming a right to the ground that I walk upon, the air that I breathe, the interactions that give my life value and the sensuous delights of the present moment. To embrace this without attachment, without seeking to claim exclusive rights over any of these things frees me to be more fully present to the natural abundance of life. The manifestation / law of attraction books and films such as “The Secret” have offered us powerful keys to help us manifest our creative potential, and they include gratitude as an important component of that. However, I’d personally love to see them focussing more on the distinctions of sufficiency and sustainability as part of the context for manifestation, and less on the acquisition of monetary wealth and the accumulation of material things for their own sake. A celebratory appreciation of the resources that we already have, including money and material assets, as well as our own skills and abilities, can free us up to find more creative ways to express and channel that which we have blessed with. When we relax the anxiety that comes from thinking we need more of everything, a whole world of already existing riches opens up. We also become more powerful attractors in the process! The workshop is open to all – and it would be great if you can join us and taste the magic of this journey with us. 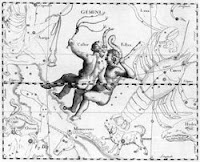 Have a great Taurean month and hope you find your treasure.